Autoloc Universal Bolt On Shave Door Kit (1 PAIR) with Alarm Autoloc Universal Bolt On Shave Door Kit With Alarm, Shave Power Kit with Alarm, Shave Door Kit with Alarm, Alarm System, Car Alarm System, Truck Alarm System, SUV Alarm System, 2 Door Shave Door Kit, Shaved Door Kit, Car Shaved Door Kit, Shaved Door Kit, [Autoloc AUTSVBCA Alarm System] - $258.95 : 3rd Strike Performance, Your Source for Late Model MOPAR Performance Parts and Accessories! QUICK & SIMPLE! Autolöc™ has made this shaved door kit simple enough to install in less than a hour! Our bracket/motor assembly bolts to your door in minutes. No need to figure out where the motor needs to go! No adjustments now or later. No loud noises when you pop your door or delays! Universal design to fit ANY make & model. Get the kit that best fits your ride! All Autolöc™ kits are available in 5, 6, 7, 10, 16, or 18 channel systems. 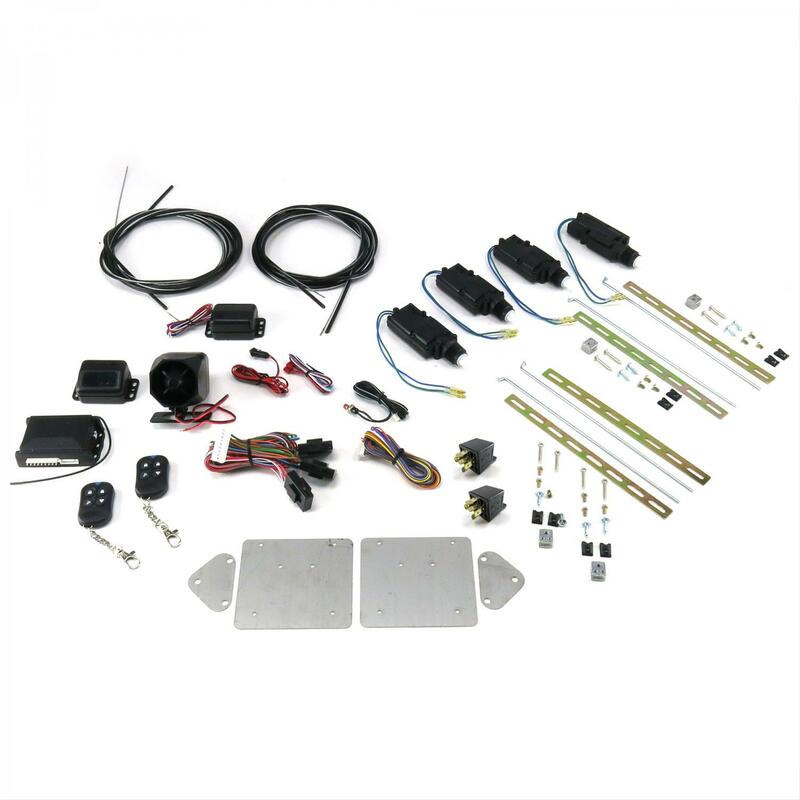 You can also upgrade any kit with an alarm for maximum protection to your vehicle. This comes with an advanced Stellar Vehicle Security system. Stellar offers the most advanced security features ever built into a compact case. With one of the most advanced Dual-Stage Shock Sensors available, the Stellar alarm is a great alternative to the over priced and hard to install alarms that are commonly available today. Using technology developed for the Tomahawk Cruise Missile, Stellar's fully adjustable Shock Sensor features Fuzzy Logic Programming, "warn first" mode, and 5 zones of protection. Each kit also includes 3 heavy-duty Keep It Clean™ 40-amp relays, 1/16 pre-stretched stainless steel cable, wiring, all mounting hardware, cable guide, aluminum crimps, heavy-duty backup button, and detailed instructions. Don't get stuck wasting your time and money replacing burned out solenoids. Get the most torque and reliability for your dollar with Autolöc™ series shaved door handle kit. No Delay: Most shaved door handle kits on the market are sold with receivers designed for a remote trunk release, not shaved door handles. This means you'll have to push the button twice or hold it down for more than three seconds. Autolöc™ actuators are specifically designed for prompt activation, ensuring that your doors will open without delay. Long Range Remotes: Each shaved door handle kit also includes a pair of long-range remotes and computerized receiver with a range of over 300 feet. Code Rolling Technology: Today's car thief uses "code grabbing" machines to duplicate a standard car alarm code. Once the car thief has the code he retransmits it out and deactivates the car alarm. At the same time the doors unlock and the car thief has full access to the car. Autolöc’s™ code rolling technology ensures your car's safety by changing codes on the receiver after each transmission. To ensure maximum protection Autolöc’s™ code rolling technology also allows you to delete lost or stolen codes. Emergency Back Up Buttons: Lose the remote? Dead battery? No problem, all Autolöc™ shaved door handle systems come with an emergency back up button that you hide on the outside of the vehicle. You may also choose to upgrade to a heavy-duty waterproof button. Independent Buttons: Push button 1, to open your driver’s door, and button 2 to open your passenger’s door. Push a combination of the other buttons to produces a constant negative output. You can use this output to operate an accessory such as your trunk, windows, or remote start.